The rodents are the most numerous of the traditional mammalian orders by a significant margin, making up about 40% of recent mammal species. Within that species diversity, over half belong to the Muroidea, the rats and mice. You thought a mouse was just a mouse and a rat was a slightly bigger mouse? Well, no. There are literally hundreds of species of mouse - about 1,300 to be more precise (if not necessarily accurate). 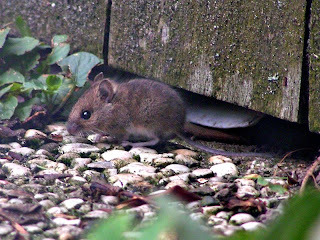 And safe in the knowledge that the thought of so many rats is going to give some of you raving heebers, allow me to introduce today's Taxon of the Week - the mouse genus Apodemus, the field mice (the image above is the wood mouse Apodemus sylvaticus, and comes from Wikipedia). Apodemus contains about twenty species distributed in broadleaf forests throughout the Palaearctic, and are the commonest rodents in said forests (Serizawa et al., 2000). Based on molecular clock studies, the genus has been estimated to have originated about eight million years ago, which is consistent with the presence of the fossil species Apodemus primaevus in Europe at the end of the Miocene (about seven million years ago - Michaux et al., 2002). Apodemus primaevus is believed to have been ancestral to the modern Balkan and Middle Eastern species A. mystacinus, a distinctive species that has been suggested to belong to its own genus, Karstomys. The majority of modern European Apodemus species were a later immigration, with their ancestor (A. dominans) arriving at the end of the Pliocene. Serizawa et al. (2000) also inferred that the various Asian species had split from each other earlier than the European species, and suggested that this may have reflected the different histories of broadleaf forest cover during the Pleistocene ice ages. Some broadleaf cover survived in Asia during the ice ages, allowing for the survival of wood mice over that time, while Europe became a broadleaf no-go zone. Oh yes, and species of Apodemus possess supernumerary chromosomes, like the ones I mentioned for Leiopelma frogs. Interestingly, Zima et al. (2003) found that there was a relationship between number of B chromosomes and body size in male Apodemus flavicollis, suggesting that males with more B chromosomes had a selective advantage, probably in terms of their ability to survive winters. Some individuals may show variation in the number of B chromosomes in individual cells, but Kartavtseva (1999) found that such mosaic individuals dropped in abundance in autumn relative to individuals with constant chromosome numbers, suggesting that for some reason they were less hardy. Kartavtseva, I. V. 1999. Seasonal observations on supernumerary chromosomes, mosaicism, and dynamics in two populations of the eastern-Asian wood mouse Apodemus peninsulae (Rodentia) from Primorskii Krai. Genetika 35: 949-955 (transl. Russian Journal of Genetics). Michaux, J. R., P. Chevret, M.-G. Filippucci & M. Macholan. 2002. Phylogeny of the genus Apodemus with a special emphasis on the subgenus Sylvaemus using the nuclear IRBP gene and two mitochondrial markers: cytochrome b and 12S rRNA. Molecular Phylogenetics and Evolution 23 (2): 123-136. Serizawa, K., H. Suzuki & K. Tsuchiya. 2000. A phylogenetic view on species radiation in Apodemus inferred from variation of nuclear and mitochondrial genes. Biochemical Genetics 38 (1-2): 27-40. Zima, J., J. Piálek & M. Macholán. 2003. Possible heterotic effects of B chromosomes on body mass in a population of Apodemus flavicollis. Canadian Journal of Zoology 81 (8): 1312-1317.